Do you need extra help for EL students? Try the Describing Angles pre-lesson. Students will be able to sort triangles based on features of their internal angles. Start off with a game of Simon Says. Direct your students to imitate you making three different angles with your arms: right angle (one at 90 degrees), an acute angle (one at less than 90 degrees), and an obtuse angle (one greater than 90 degrees). As you make your angle and the students imitate you, tell them the definition of each angle you make. For example, "Simon says make a right angle; this angles is at 90 degrees." Provide visuals of each of the angles with their names for ELs to model. Allow them to repeat the definitions in their home language (L1) or their new language (L2). Define the terms actue angle, obtuse angle and right angle and create hand motions with students' input to represent these terms. Have students restate the definitions using some of the following math key terms: "obtuse," "acute," "right angle," "degrees," etc. Hand out and preview the Sorting Triangles worksheet and observe the shape labeled #9 in the shapes box. 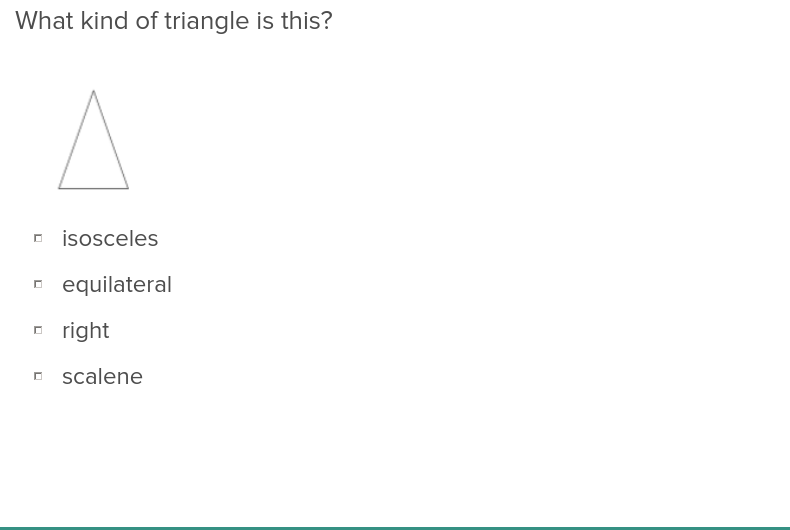 Have students review the angle categories, turn to a neighbor and share which category triangle #9 belongs in. Allow for students to determine that it is an obtuse triangle and place the number 9 on the proper section of the diagram where obtuse does not overlap with another category. Answer any clarifying questions. Have them sort the triangles into two groups before they sort them into three different groups. Then, ask them to support their choices based on the definition of the angles. Ask students to share why they think the angle is an obtuse angle. Have them use describing terms and mathematical terms. "I know this is an obtuse triangle because____." "I know this angle is larger than 90 degrees because ____." Repeat the process for another shape, but allow students to determine the proper placement of the shape number. Guide your students with leading questions as needed and answer any clarifying questions. Allow ELs to work with sympathetic partners that will assist in sorting the shapes and understand the ELs' L1 or L2. Ask them to explain their choices to their partner in their L1 or L2. "Does the angle measurement look larger or smaller than 90 degrees?" "Does it look like it's 90 degrees?" "What is this shape called (e.g., rectangle, parallelogram, triangle, trapezoid, etc.)?" "Are all the angles in the triangle the same?" "I know ____ so ____." "This shape has ____ so ____." 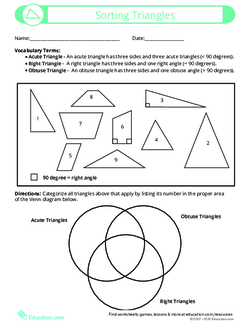 Have your students complete the remaining exercise on the Sorting Triangles worksheet. Provide vocabulary cards or visuals with definitions in their L1 and L2 to support them as they sort the questions on their own. Allow students to use shape manipulatives to help them categorize the shapes. Give students the opportunity to share their answers with their partners after they've completed the rest of the sort. Inform students to cross off items that don't qualify for categorization (e.g., the quadrilaterals) to limit potential triangle choices. Students can focus on one angle type at a time (e.g., acute triangles) and cross off their choices as they go. Students can make a poster for one or both of the Thinking Deeper activities using pictures, words, and numbers. Show students three different types of triangles numbered 1, 2, and 3. Say a category (i.e., obtuse triangle, acute triangle, right triangle) and have them show a number with their fingers for the category the triangle belongs to. Choose students to share their rationale using some of the key terms from the lesson. Allow students to give their explanation in their L1 or L2. Encourage students to use the sentence stems from earlier to help them support their answer aloud. Review the answers as a class and allow for peers to assist with incorrect responses. Assign an exit ticket activity where students modify one of their choice of angles 6–8 so that they COULD be placed in one of the three diagram categories. Continue to allow students to use their support materials but notice if they do not need them anymore. Encourage them to use manipulatives when creating their adjusted shapes. Allow them to check their answers with sympathetic partners before sharing their answers aloud. Assess whether students can change shapes 6–8 without their support materials. Ask them to justify their answer for one of the shapes. Keep students’ learning on point with this effective and efficient study of the properties of triangles.